Pride means the end of wisdom. It is just like learning archery; eventually you reach a point where ideas are ended and feelings forgotten, and then you suddenly hit the target. "I am leaving this legacy to all of you ... to bring peace, justice, equality, love and a fulfillment of what our lives should be. Without vision, the people will perish, and without courage and inspiration, dreams will die — the dream of freedom and peace." Rosa Parks, a seamstress from Montgomery, Alabama, who would not give up her bus seat to a white man in 1955, died Monday at the age of 92. Historians mark the date of her quiet-but-revolutionary act as the start of the modern civil rights movement in the United States. If you had seen Rosa Parks walking down the street, in recent years, you would never guess that the slender, silver-haired lady with large spectacles had anything to do with an event that ignited black civil rights as one of the main national issues of the middle 20th Century. On December First, 1955, Mrs. 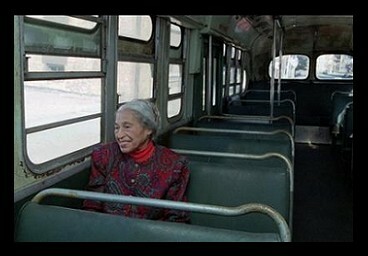 Parks had finished her work as a seamstress in a Montgomery, Alabama, store and boarded a city bus to go home. She took a seat in the 11th row, behind the seats reserved exclusively for white passengers, as required by the city's segregation law at that time. Blacks were entitled to seats from the 11th row to the rear of a bus. However, the city law said if the first 10 rows were filled, a white passenger could request a seat in the back of a bus. Rosa Parks remembered the bus was crowded with people standing in the aisle when several whites boarded. A white man told the driver he wanted a seat. The driver, who had the authority under city law, went to the rear of the bus and ordered Mrs. Parks and three other black passengers to get up. The others reluctantly stood. Rosa Parks, tired after a day of work, refused. "When they stood up and I stayed where I was, he asked me if I was going to stand and I told him that 'no, I wasn't,' and he told me if I did not stand up he was going to have me arrested. And, I told him to go on and have me arrested," Mrs. Parks said. The bus driver called the police and when they arrived he told them he needed the seats for his white passengers. "He pointed at me and said, 'that one won't stand up.' The two policemen came near me and only one spoke to me. He asked me if the driver had asked me to stand up? I said, 'yes.' He asked me why I didn't stand up," Mrs. Parks said. "I told him I didn't think I should have to stand up. So I asked him: 'Why do you push us around?' And he told me, 'I don't know, but the law is the law and you are under arrest.'" "This was not the way I wanted to be treated after I had paid the same fare this man had paid -- he hadn't paid any more than I did but I had worked all day and I can recall feeling quite annoyed and inconvenienced. And I was very determined to, in this way, show that I felt that I wanted to be treated decently on this bus or where ever I wasMrs. Parks said. Rosa Parks, who worked for the local chapter of the National Association for the Advancement of Colored People, the NAACP, continued to assert that she had not intended to provoke her arrest. "I had only intended to go home and take care of whatever matters I had because I had an NAACP youth conference that weekend and I also was getting out the notices for the senior branch of the NAACP (convention). I didn't move because I didn't feel like it was helping us or making things lighter [easier] for us -- me as an individual and us as a people to continue to be pushed around because of our race and colorMrs. Parks said. Her arrest for violating the city segregation law was the catalyst for a mass boycott by blacks of the city's buses, whose ridership had been 70 percent black. That boycott brought the young minister Martin Luther King, Junior, to national prominence as the head of the Montgomery Improvement Association, the group that organized and led the protest. The Montgomery Improvement Association also filed a federal suit challenging the constitutionality of the segregation law on February first, 1956. The boycott continued 382 days, until December 20, 1956, when the United States Supreme Court ordered city officials to desegregate their buses. Rosa Parks was born Rosa Louise McCauley on February Fourth, 1913, in Tuskegee, Alabama. Her father was a carpenter and her mother, a teacher. They enrolled Rosa in the Montgomery Industrial School for Girls, a private school that encouraged each girl to "take advantage of the opportunities, no matter how few they were." In those days, "few" was the key word for blacks, especially in the southern states of America. Rosa told a newspaper that blacks didn't have any civil rights. She said, "It was just a matter of survival...of existing from one day to the next. I remember going to sleep as a girl and hearing the Ku Klux Klan ride at night and hearing a lynching and being afraid the house would burn down." When she was 19, she married Raymond Parks, a barber who was active in black civil rights and voting registration. She attended a small black university in Montgomery for a few years and then worked for the Montgomery Voters League, the NAACP Youth Council and other civic and religious organizations. Having gained a reputation for getting things done, she was elected secretary of the Montgomery chapter of the NAACP in 1943. At that time the civil rights organization had to spend much of its energy working on cases of white violence against blacks. Aside from beatings and murder, blacks had to contend with peonage, a system where blacks who owed money or were in jail would be forced to perform labor without receiving pay. She said, "We didn't seem to have too many successes. It was more a matter of trying to challenge the powers that be, and to let it be known that we did not wish to be continued as second class citizens." During the next 20 years Mrs. Parks helped support her family by taking sewing at home. She also worked as a house cleaner and for a brief period as an insurance agent. The Parks family moved to Detroit, Michigan, soon after the conclusion of the bus boycott because of continuing threats of violence by the racist organization the Ku Klux Klan as well as by angry individuals who held Mrs. Parks responsible for the desegregation of the city buses. Raymond Parks resumed working as a barber. Rosa, after recovering from stomach ulcer problems, was hired by Michigan Congressman John Conyers, Junior, as a secretary and administrative assistant. In the following years the shy lady conquered her fear of public speaking and became a spokeswoman for civil rights issues. In later years, Rosa Parks received honorary university degrees and various awards from civil rights organizations. The city of Detroit, Michigan, named a street for her. In 1989, one of the most unusual tributes came from the Neville Brothers singing group who honored her by writing a song entitled "Sister Rosa." Its reggae chorus is: "Thank you Miss Rosa / You are the spark / You started our freedom movement." "I've managed -- someway -- but there are times when I didn't want to take as much responsibility as they put upon me, but I accept whatever comes if it's going to be of any help to other peopleMrs. Parks said. Rosa Parks, who ignited the modern civil rights movement in the United States when she refused to surrender her seat on a bus to a white man on December First, 1955. Rosa Parks -- dead at the age of 92. This is how change happens, one person at a time. I won't over-inflate what she did, she did it for herself because she was just pure tired and fed up. She didn't do it for any fame or to start a movement, but it's good it got a lot of people thinking and acting. purely fed up! pure intention to put my foot down. Enough! in it's purest sense, and look what it accomplished. Rosa! A rose by any other name will smell as sweet but not as sweet as her. Spreads across the world. Hambe Khale, Rosa. WASHINGTON -- The man behind the blockbuster "Star Wars" saga has stepped forward in a big way to help preserve the legacy of civil rights leader Dr. Martin Luther King. George Lucas Thursday donated $1 million to help build the Martin Luther King Jr. Memorial project, organizers said. "The ideals and principles for which Dr. King fought have never been forgotten and are as relevant today as they were 40 years ago," Lucas said in a statement. "Martin Luther King Jr. has inspired millions of people, and this memorial ensures that his message endures for many generations to come." According to organizers, $40 million of the $100 million needed to fund the project has been raised thus far. Other notable supporters of the project include former Secretary of State Colin Powell and Jack Valenti, former president of the Motion Picture Association of America, and Oscar-winning actor Morgan Freeman. Groundbreaking is scheduled for late next year on a four-acre site near the Lincoln Memorial, where King delivered his "I Have a Dream" speech. Parks stated in her autobiography, My Life, that it was not true that she was physically tired but was "tired of giving in." Also, some accounts downplay her prior involvement with the NAACP and the Highlander Folk School in an attempt to portray her as an average, middle-aged woman and not a political activist. At the time of her refusal to give up her bus seat (1955,) Rosa Parks had already become Secretary of the Montgomery , Alabama branch of the NAACP (1943,) where she had met Dr. Martin Luther King, Jr. and was inspired to join the Civil Rights movement. Do take a look and listen.